By now most children have broken up from school for the holidays. So what can they make whilst you run about finalising Christmas that is fun, festive and to make you very proud? These wreaths made from papier mache (leave 24 hrs to dry before decorating) and rice /pva and pom-poms. 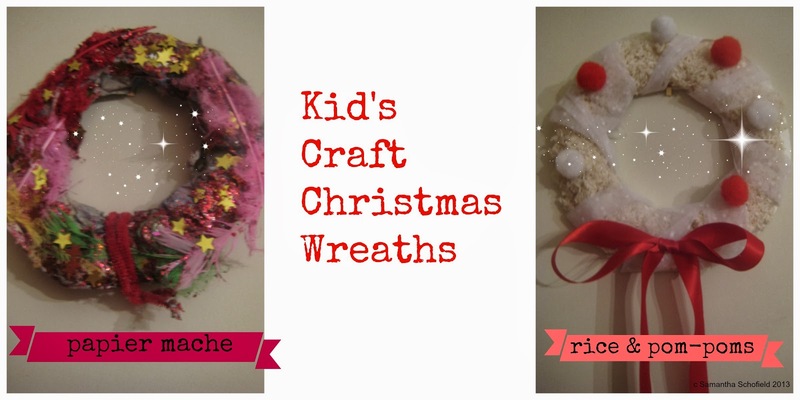 The creations are perfect for pre-Christmas crafts and extra decs too. 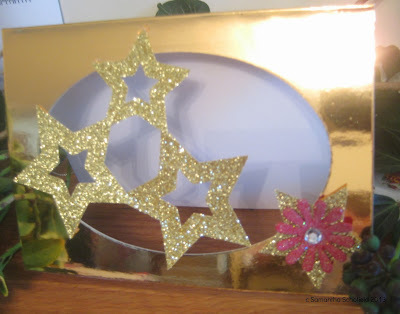 My two year old made the papier mache version with feathers and golden stars. A very proud Mummy. The rice and pom-poms version was made using a paper plate with a hole cut out as the base. We wrapped ribbon around it and glued on the pom-poms. Easy and so, so much fun. You may keep them for next year! Try making an Italian Christmas Cake this year and make it tomorrow. It's amazing...believe me. Bath Bombes, I gave them as presents last Christmas and my friends loved them. I was really touched! I wrapped them in little acetate bags and tied the tops with raffia. They are gorgeous little mince pie bath bombes. How pretty? Back again, I created these after seeing all the amazing cookies made for National Cookie Day in the US a few week ago. I was inspired by a Nigella recipe but wanted to use white chocolate and lots of Christmas flavours. 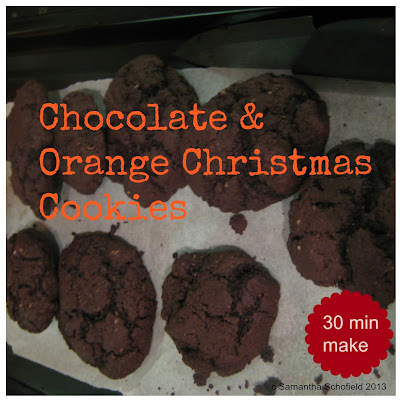 These have a real Christmassy taste to them with orange essence and a little cinnamon. 1. Melt the chocolate in a pan on a low heat. 2. Cream the butter and sugars together. Add the orange essence. 3. Add the melted chocolate. 4. Mix the flour, bicarbonate of soda and salt together and sieve in. 5. 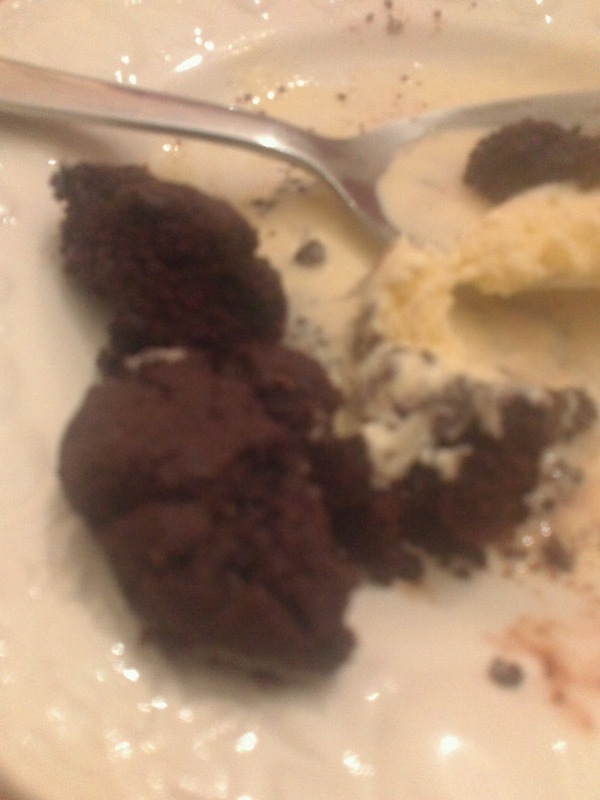 Mix the mixture and then spoon in dessert spoon size chunks onto a greaseproof lined tray. 6. Bake for 20 minutes and leave to cool on a rack. They are great warmed with ice cream ...mmmm! Happy baking! Share your Christmas bakes at #createitsamantha. 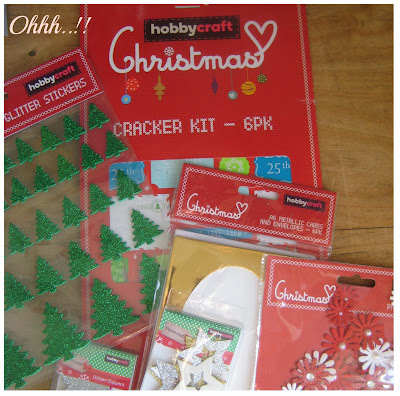 I was delighted when Hobbycraft approached me to review some of their Christmas products. Hobbycraft is a crafters dream, ailse after ailse of all things to creative! Many of you know that already, but I'm a bit of a fan... At Christmas time you can get all your crafts under one roof from dressing the table to homemade gifts, it's perfect for busy people. 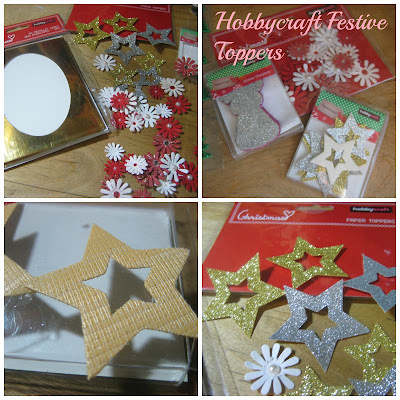 Hobbycraft sent me a selection of Christmas cards toppers, stickers and gorgeous festive gold crafting cards plus a cracker kit to review. 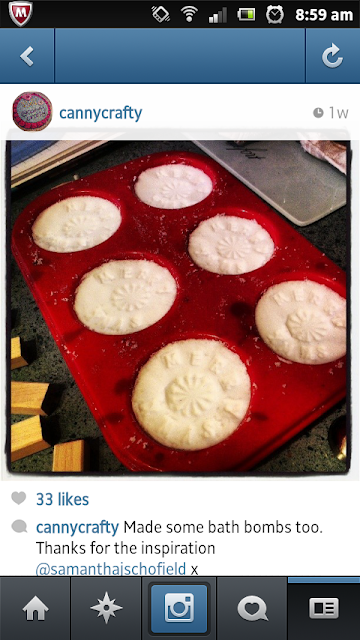 Homemade crackers, how amazing!! The first thing that I noticed about the range was the quality. The card toppers are really great with a rubber easy grip backing which not only means they don't warp and bend, simply they are easy to work with and the glitter is fine so doesn't come off on your hands in big flakey chunks! I'm not going to be wearing craft glitter on my face this Christmas time. As many of you have already made and sent your Christmas cards, now is the time to make the cards for new years parties, place settings and luxury keepsake cards. If you are like me, you have been card crafting away for months and now is the time for some really exciting bespoke ones! 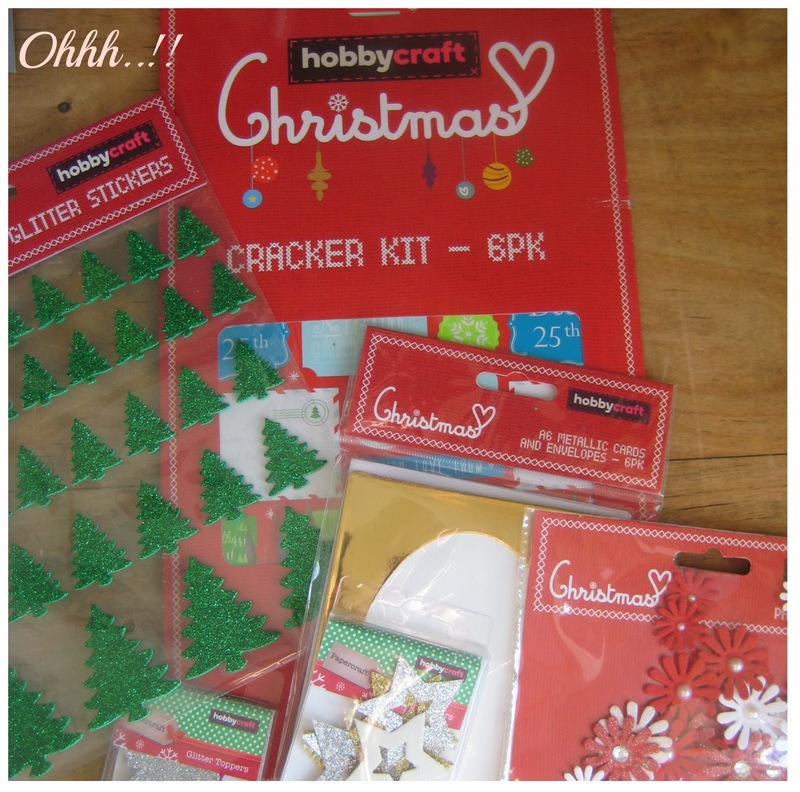 Many lines are on 3 for 2 as well, check out Hobbycraft's Christmas pages and start planning. 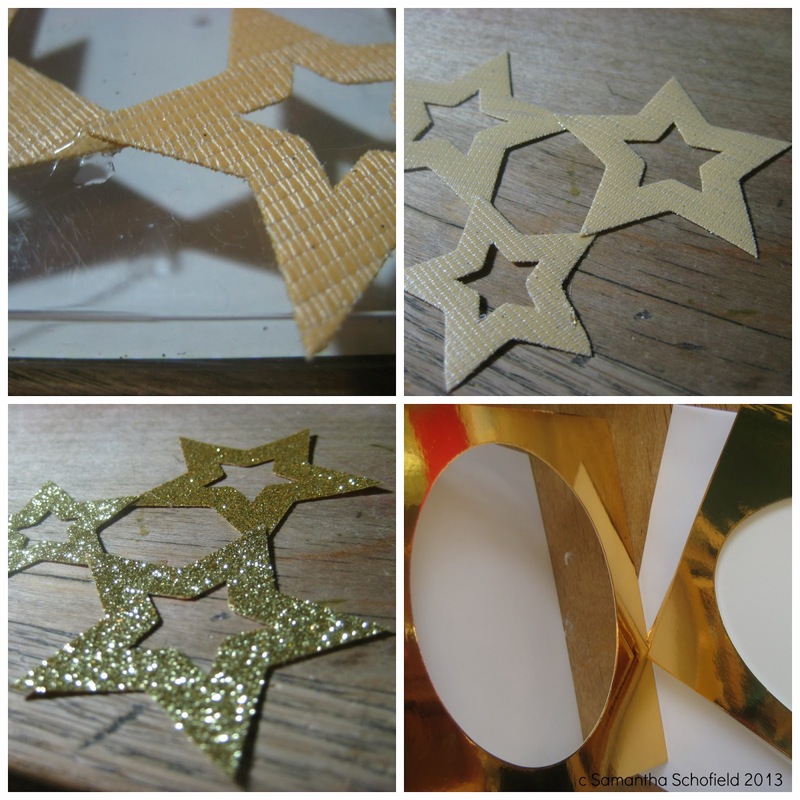 So for those posh cards that you want to make in super quick speed (as it's Christmas nearly and we're busy), why not try out these two luxury tutorials? The gold foil cards have a cut out and no backing like a traditional gated card so not wastage cutting off the inner card flap. 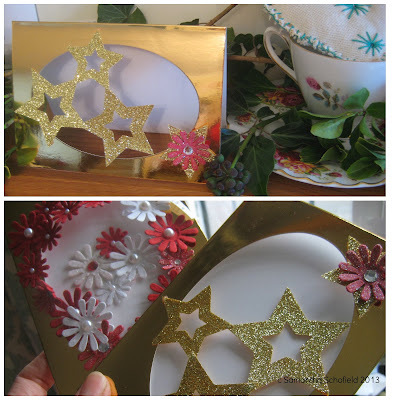 They are great to make lace effect cards with as you can see the message through the stars which is a lovely touch. Simply glue the stars together point to point on the backs on a acetate surface (this is because the glue will peel off). Leave to dry and then glue to the card point to point. Leave a few minutes to dry and hey presto...you're done! This card looks amazing for a place setting or New Year's party. Stars and sparkle this Christmas! 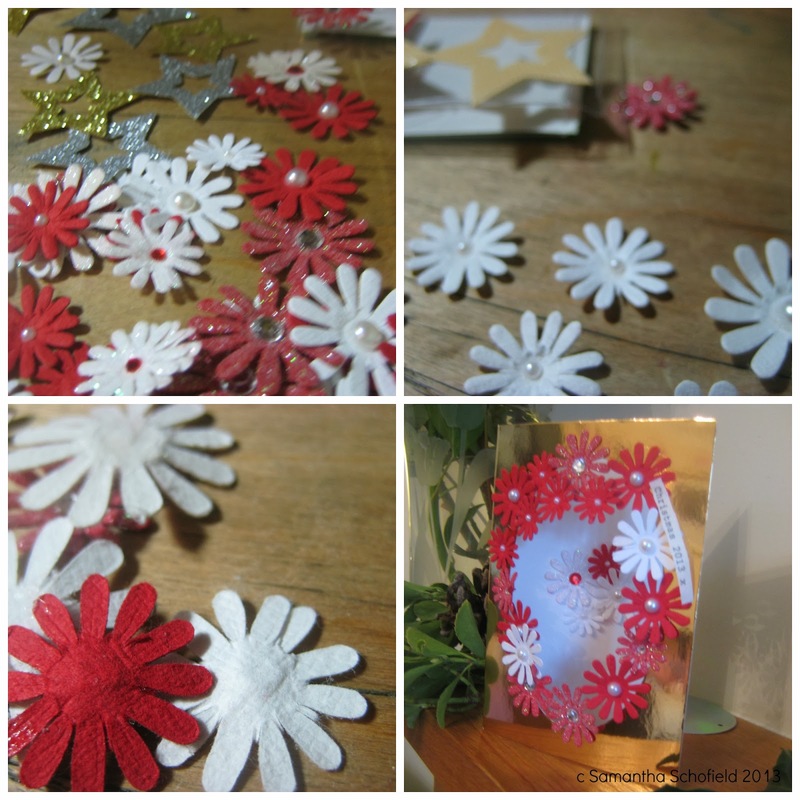 The flower toppers are great to work with too, try the same principle of sticking the petals together instead of the star points! 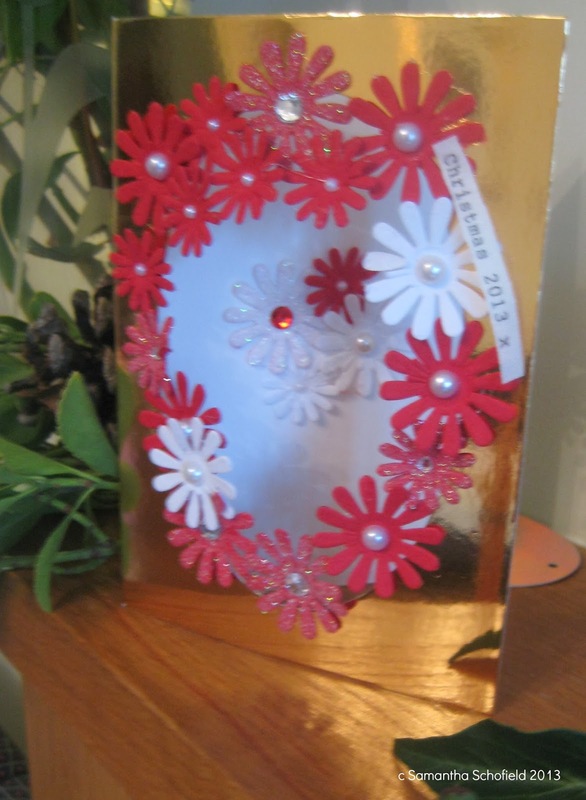 I'm inspired by the fresh flower cards you can delivered from your local florists. How pretty are these floral toppers? I finished the card with a vintage typed message 'Christmas 2013' on fabric I put into my vintage typewriter! 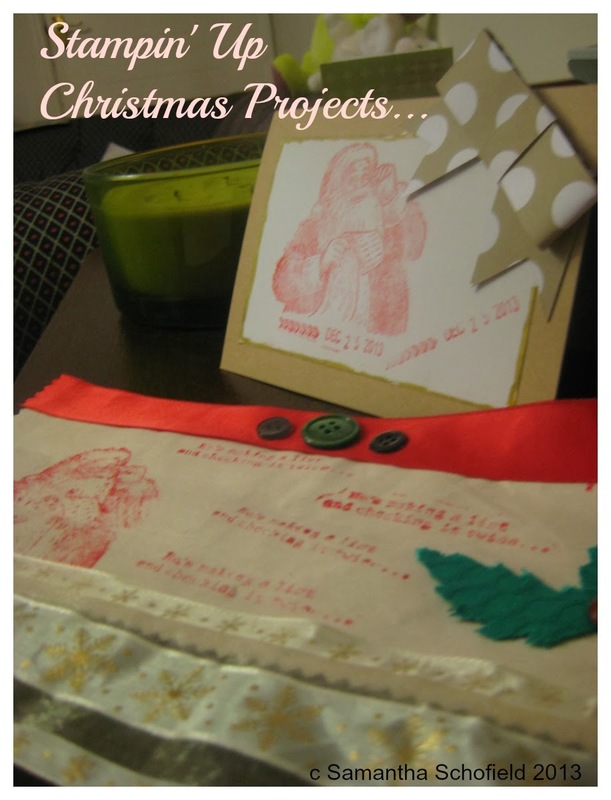 I hope I've inspired you to make some great handmade cards this weekend? 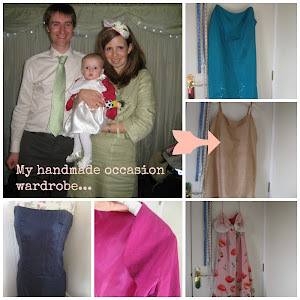 Love as always to see pictures, tweet or post them at #createitsamantha. A chance for creative & crafty bloggers to meet up in Nottingham. We're having a craft swap, goodie bags and great topics to improve your blog for 2014, all in a new cafe based in the city centre. Space for babies too! We are super excited and there will be more announcements about the meet up here on the blog so stay tuned! This morning was a dark December morning here in Derbyshire. Then the sun broke through the clouds and Fig Tree Road posted my happy DIY Christmas wreath tutorial! Hooray for Mondays. Thank-you to Charlotte for inviting me to guest blog for her. DIY Christmas wreath tutorial! 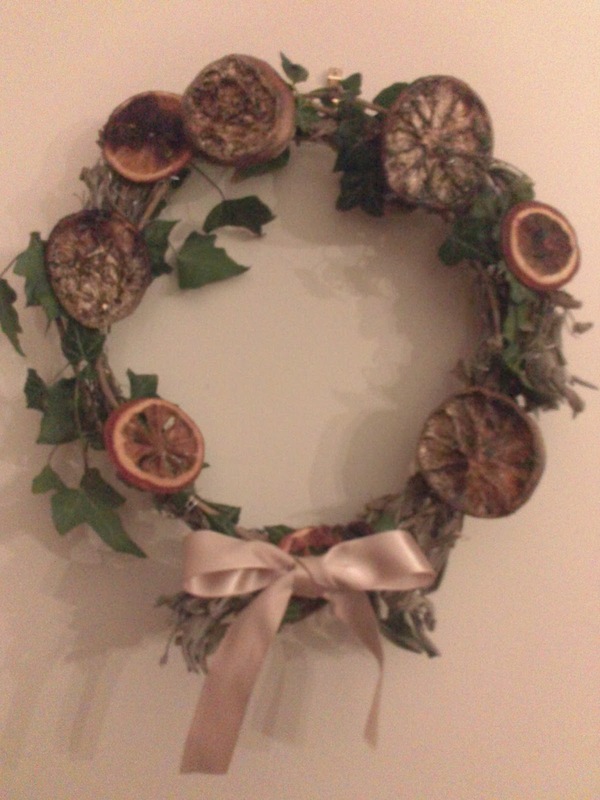 If you love DIY Christmas projects have a go at this eco-friendly wreath. 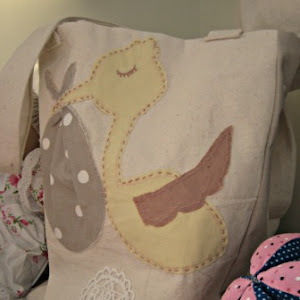 I love Charlotte's online gift shop, full of lovely eco-friendy loveliness. Check out her Mr and Mrs Ring Dish, a perfect little Wedding gift. I've got some more wreath ideas coming up, so I'm off to rummage in the ribbons and bow stash again. Today is Small Business Saturday in the UK, support the smaller guys on the busiest shopping day of the year. So, here are some of my fellow Banks Mill Studios members, whose work I had to share today! Ruth Grey's charming art prints of Derbyshire really depict our county from the peak to the town centres. Mr.S (my very patient husband) spends every a lot of time in Derbyshire on his bike and say's Ruth really captures the scenery he sees on the bike throughout the seasons. Take a look at her website. Anne Wassle creates bespoke pet portraits here in Derbyshire. For any pet owner a personalised portrait of your pet is such a bespoke gift. Check out Anne's website for the pet owner in your family! How beautiful are these dogs? Sarah Copson's personalised illustrations are perfect for the someone in your life who is looking for that unique artwork. I was lucky enough to have a stand next to Sarah's ,so got a good look at her portfolio of work. Sarah, like myself is new to Banks Mill, so her talent and style is fresh to the Mill this year. Check out her website for more inspiring work. I love this quotation poster. If you have any other Derbyshire arty gifts, drop me a comment and I'll take a look. 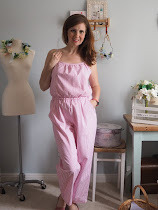 It's been a busy week of all things paper...And I'm on Helen's blog All Things Stampy too.. 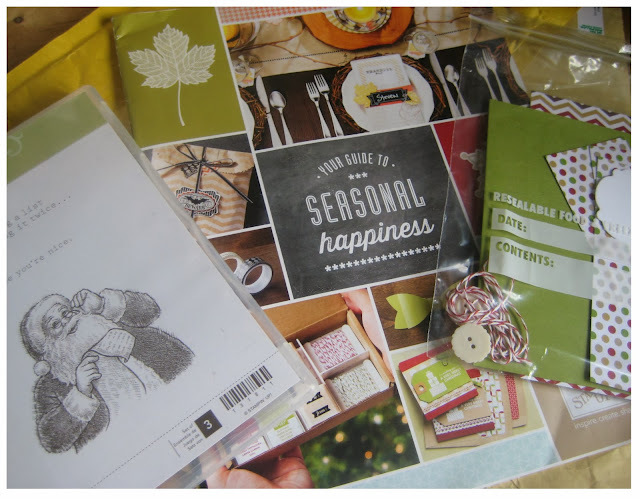 I was super excited when the lovely Helen at Stampin' Up sent me this very happy mail to review. 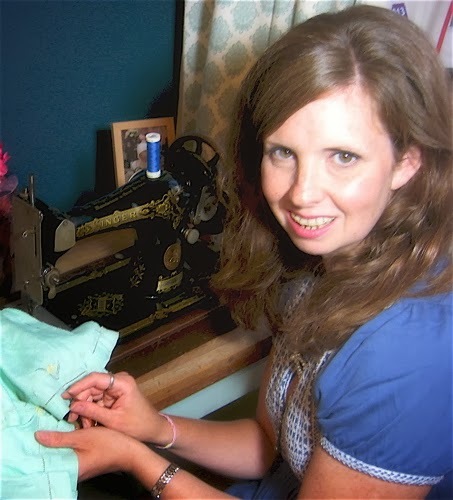 Helen writes a great blog about her stampy journey, check it out! 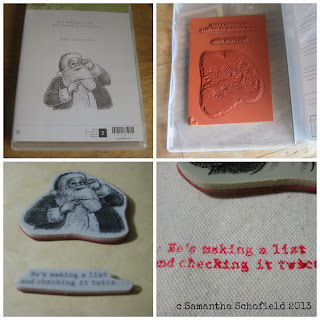 I love Stampin' Up stamps and papers as the quality is fantastic and the colours all match! So it's easy to be creative (in a hour of so) and produce so great paper crafts. 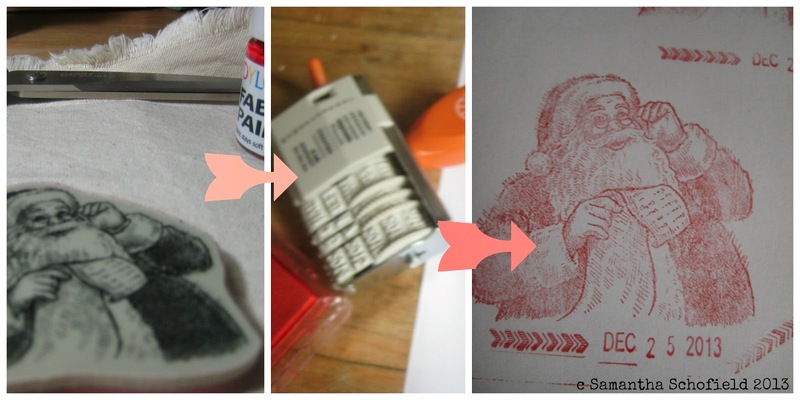 I had a practice with the vintage style Christmas stamp that Helen sent me and the detail is pretty amazing. Plus the quote is awesome on it to, my husband is a Bruce Springsteen fan so I'll be using it on his Christmas gift tags! First of all I flipped out the Santa stamp and used my crafty date stamp from this post to stamp Christmas day's date on the design. The Stampin' Up stamp comes in a DVD style case, so it's suitable for stacking. You need to use a acetate block to attach the stamp so you can just 'kiss' the paper or fabric and ta-da the image is there. I used an ink pad to transfer the image onto paper and fabric paint painted on the stamp to transfer to fabric. and the details great on fabric too! 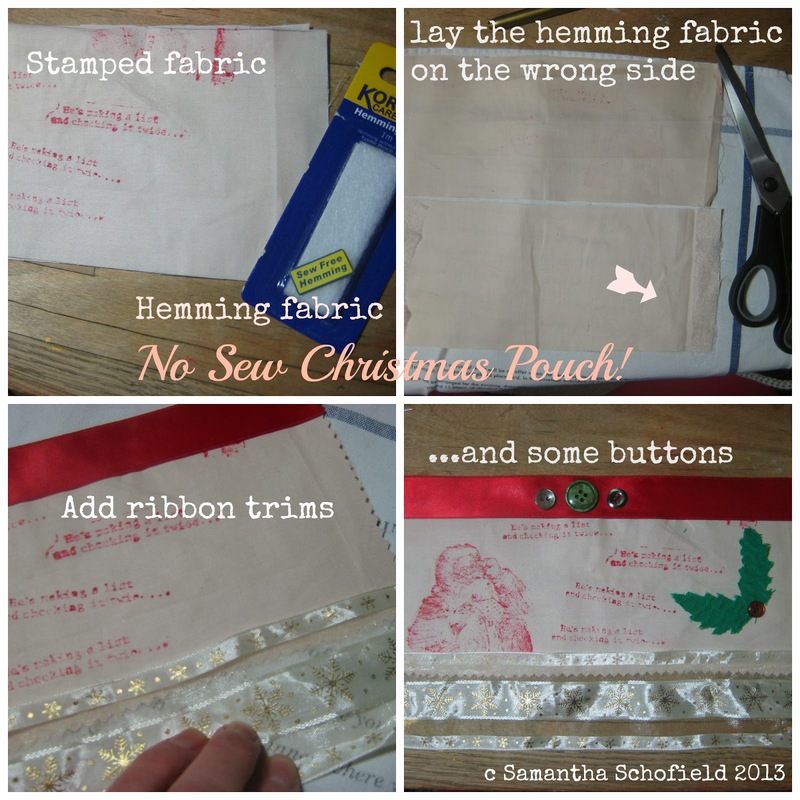 Once I had my fabric stamped I got to work on making my no-sew pouch. Cut out two pieces of fabric and with hemming fabric (the type you by in the supermarket I used Korbond's version) place the pieces face down and cut enough fabric to edge the side and bottom of the fabric. OK,then I placed the other pouch piece on top face up to make a sandwich. I then took a piece of greaseproof (freezer) paper on placed on top of the fabric sandwich and pressed. This will glue your fabrics together. I then used the same process to add the trims and glued on a cute holly leaf and button. Perfect for your Christmas table. After cutting out the stamped design, I added gold pen to the edging and attached it to a card. 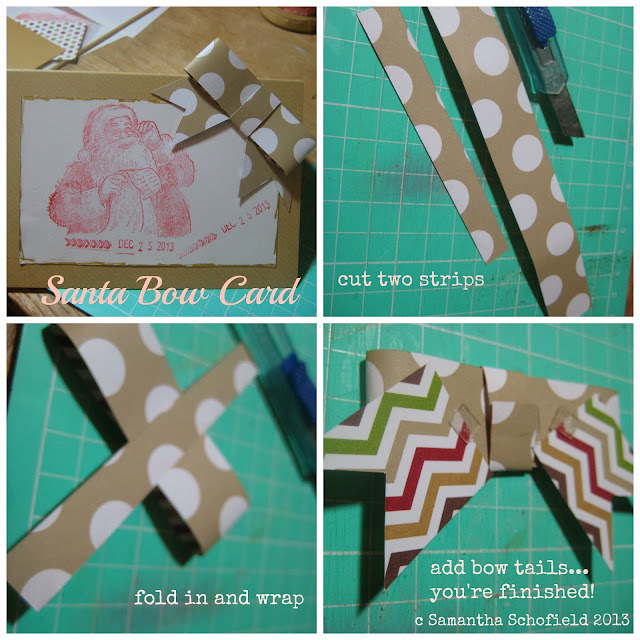 take two pieces of card, wrap one and fold the other over. Then add two small bow tails to the back with crafting squares and attach. 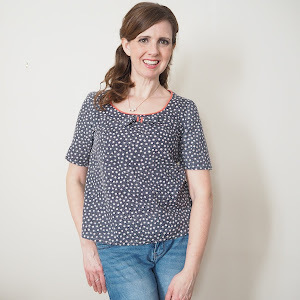 Crafty Friday - back-to-basics class for a small friendly group. Only three places remaining. 9.30am-11.30am To register, email Helen. Happy Advent, first of December and first of the month! 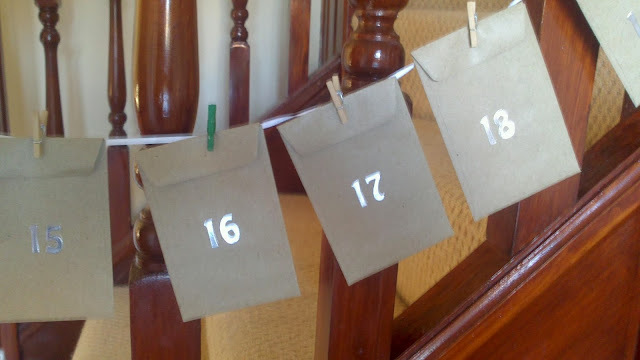 Today we put up our Advent Calendar, I wanted to make a crafty DIY version, so with a few craft bits; ribbons, pegs and envelopes I made this garland to hang on our stairs out of reach of little hands. I hope it will be great for Little L"s development too as she can share, count, wait and most of all enjoy! Advent Garland - simple and perfect for little hands!